A person with blindness will not be able to see anything even in light. Blindness cannot be treated even with glasses or contact lenses. Blindness can also be partial blindness. But, in general blindness is referred to complete blindness. It is also known as vision impairment or vision loss. A person can be blind from birth itself. In some cases, blindness may even by our daily activities like accidents caused during driving, reading, walking, etc. 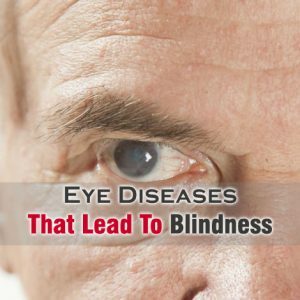 There are even certain cases, where eye diseases that lead to blindness. So, knowing about these eye diseases can help to treat them effectively and thereby helps to prevent blindness. According to W.H.O, nearly 80% of the blindness cases can be prevented by treating the underlying diseases properly. Untreated retinal errors are one of the common causes of blindness. Untreated retinal errors accounts for about 40% of blindness caused by eye diseases. Retinal errors include near sightedness, long sightedness, astigmatism, and presbyopia. All these eye problems can be easily treated with glasses or contact lenses. Cataract is also one of the common eye diseases that lead to blindness. Cataract is the cloudy and dense formation over the eye lens. This disease results into gradual decrease of vision slowly, and if left untreated will result into blindness. Cataract can be effectively treated surgically. Glaucoma can also result into blindness if left untreated. Glaucoma is results into optical nerve damage, and thereby results into loss of vision. Glaucoma can be effectively treated, if done in early stages. Medications, laser treatment and surgery are used for treating Glaucoma. Diabetic retinopathy is also known as diabetic eye disease. This eye disease involves retina and light-sensitive tissues at the back of the eye getting damaged due to diabetes. This is can result into result to blindness. Laser treatment and surgery is used for treating diabetic retinopathy. It can be prevented by maintaining proper blood sugar level. Retinal detachment is a serious eye disease, which needs immediate medical attention. This eye disease is caused when retina gets separated from back of the eye. This can result into partial or permanent loss of vision. What Are The Common Causes Of Uveitis In Humans?